1 year and 10 months! That 's how long it took me to finish this Cardigan. 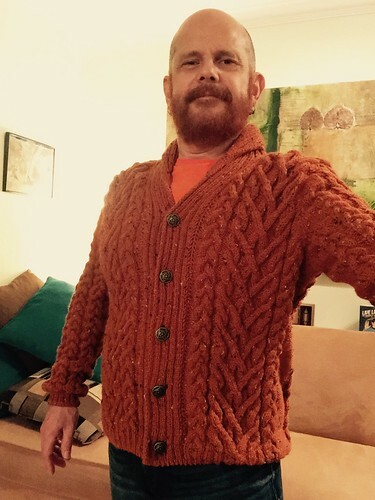 It is a great knit, but too many cables. The instructions are pretty good, 99.9 %. This will be a project that I would make again. I am in the workings and thinking about adding pockets to the Cardigan, but I have to see if I have the time to add pockets . I like it just as it is. I do have some new patterns that I want to publish, and will have the time now to work on the patterns. Thanks for stopping by.